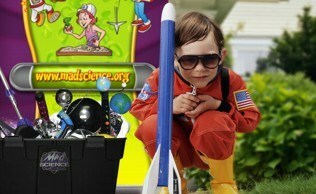 Mad Science Summer Camp offers five different camp themes. Each theme is appropriate for children in grades 1-6. Based on your child's interests, you can choose a theme which offers a variety of topics or one that offers an in depth learning experience on one topic. Shake, rattle and roll into summer as campers explore the wheel and axle and other simple machines that make our lives easier and more fun! Using their new found engineering skills campers will create strong structures and test the strength of one of nature’s strong objects…the egg shell. Create cool potions and mad mixtures as campers learn about chemical reactions through hands on experimentation. Discover the advantageous features of our flying friends as children delve into the world of birds, and bugs while creating their own bird house. Jr. Engineers - Check out super structures and what makes them stay standing. Explore strong shapes as you build a 4 foot high geodesic dome. Strategize about strong shapes as you engineer your own bridge and test its strength. Campers will create a cool 3-D puzzle and a tessellated brain teaser that will keep your friends and family stumped. Machine Mania – Discover the mechanical advantage of using simple machines. Children will explore how each machine works and helps us do work. Build your very own catapult, a ping pong ball launching lever. Crazy Chemistry – Become a true Mad Scientist as campers explore and experiment in the world of chemistry, make bubbling brews and cool concoctions. Learn about acids and bases, and the signs and symptoms of a chemical reaction. The fun really heats up as campers create their own sidewalk chalk and to cool things back off again make a bath fizzer. The Birds & The Beasts – Campers will learn all about the adaptations that allow birds to excel. Investigate their feathers, habitat and diet as campers dissect an owl pellet. Next take a closer look at insects, the most numerous type of creature on our planet. Shutterbugs – Light up your summer as campers explore the science behind light, cameras and moving pictures. Flip the world upside down as you experiment with a camera obscura. Children will make and keep their very own kaleidoscope and see light’s true colours shining through their own pair of diffraction glasses that splits every source of light into rainbows! Finally, fool your eyes as campers investigate how movies work and create their own flip book. A week of sleuthing, investigation and discovery awaits campers. Secret code wheels, Morse code and hidden messages will be revealed. We will hunt down animal tracks and follow scent trails during a day of nature discoveries. A renewed appreciation for the earth and the role science can play in preserving our planet will emerge. The wonders of gravity, balance and how science affects the sports we play will be explored. Help protect our good friend Eggbert as he joins us in sport. The marvels of astronomy and our solar system will be explored as we investigate the cosmos. Mad Messages – Children learn about cryptography and codes and other methods of hiding our true message. Create and pass secret messages using a code wheel, write messages that can only be revealed by chemical means and learn how we can use colours to disguise our words. Campers will put their new found skills to the test as they solve the great slime mystery, cracking the chemical code and making their very own ooey gooey slime. Nature – Get a close up look at nature as we explore the environment around us. Animal adaptations are investigated as campers discover how creatures eat, hunt and protect themselves from becoming a meal. Test your sense of smell and see how it compares to that of an animal. Campers will learn about unobtrusive ways to study creatures and create their own animal track to take home. Earth Awareness - How are we hurting Mother Earth? Discover how science will help us protect our planet. Children will learn the basics of water pollution, acid rain, and how a lot of small actions made by individuals can add up to destroy an ecosystem. Children will experiment with methods of cleaning water, one of our most precious resources. “Reduce, Reuse, Recycle” as children make them own paper from recycled newsprint. Chemical Counting – Explore the “nuts & bolts” of chemistry, starting with the principle of “chemical counting” using model atoms to build familiar molecules. A mystery solution’s contents are determined via chemistry. Topics here range from creating electrical current using chemical systems (exactly as a battery does) to plating (chemically bonding) one metal onto another. Space Day - Young astronauts explore the mysteries of the solar system. Children will discover some of the challenges facing astronauts that live and work in space. Investigate how gravity on different planets and the sun would affect our weight and our ability to jump and throw. Break free from the force of gravity as we launch a rocket into the sky! Campers will use forensic science to solve a crime. A visit to Cell City will reveal the inner workings of DNA while a trip down the Organ Trail will provide a Body Portrait. Explore the wonders of gravity, balance and the science behind the illusive sweet spot. Build the strongest helmet for our friend Eggbert in our safe egg challenge. We will discover how to get a rainbow in a test tube and build a Potato Power Plant during a day of radical chemical reactions. The Organ Trail – Students are introduced to the circulatory, respiratory, digestive, skeletal, and– muscular systems. In the process they learn about some of the body’s most important parts: the heart, lungs, stomach, brain and more. They listen to their hearts, act as lung and muscle models and observe life-like replicas of our organs. At the Scene of the Crime… –The importance of observation as part of the scientific method is the day’s first order of business. A mock crime scene is examined; relevant information presented in many formats. Campers are then challenged to sort and sift through the data in an effort to solve the "crime" using forensic techniques. Cell City –Campers are introduced to several cell organelles and their functions. The membrane, mitochondria, nucleus, ribosome, and lysosome receive most of the attention. At times they will imitate the action of each of these parts with special emphasis on the nucleus and the role of DNA in directing and recreating life. They will learn the basics of the code of life, and make a model of a cell. Radical Reactions - What holds atoms and molecules together? What happens during chemical reactions? These questions are answered while campers study physical and chemical reactions in depth. These reactions include those that emit heat (exothermic), those that require heat (endothermic), those that proceed at a very fast pace and reactions that occur in spite of the fact they shouldn’t! The Science of Sport –What do football players, scientists and ballet dancers have in common? Explore how Isaac Newton affects how we play sports and move the way we do. Campers will test their own center of gravity and experiment with the effect of toe size on balance. Children experiment with games and activities while learning how physics and chemistry affect the science behind our favourite sports. Children will overcome a series of challenges using basic materials, simple machines, tips from famous inventors and most important of all – their mind. Learn with some of the world’s most famous inventors and dreamers as campers create catapults and forts, complete noisy electrical circuits and make a futuristic light stick. While Thomas Edison said "invention is 10% inspiration and 90% perspiration", this is 100% FUN! Rock, Paper, Scissors – Inventing means curiosity! Leonardo da Vinci started as an artist and made many scientific observations that he recorded in his notebooks over the course of his lifetime. Children learn about his many discoveries and try their hand at some his experiments; writing notes backwards, measuring human proportions, building a self-supporting arch bridge and building catapults. The budding inventors bring home their da Vinci designs and devices at the end of the day. Whiz Kids – Inventing means practicality! Inventions and patents to protect an invention were very popular in the late 1800's. Inventors Alex Graham Bell, Thomas Edison and Nikola Tesla were locked in several battles over electrical inventions of their era. Children work together to form circuits and recreate Tesla’s bright atmosphere for the 1893 World’s Fair. They talk about sound and learn that anyone, a child, woman or man, can be an inventor. The class moves from simple devices to Rube Goldberg machines and the children perform as parts of a complex human-machine. The children prepare a patent proposal and receive a patent certificate at the end of the camp day. Shipwrecked – Inventing means necessity! Archimedes and Benjamin Franklin both created devices to make their societies function smoother. This day puts children on a deserted island in which they must work together to invent a means to collect food and water, build shelters and construct bridges. They use the tools at hand to write messages to send in a bottle and witness a volcanic eruption. The children eventually design a boat to escape the island and bring it home. Think Fast – Inventing means cooperation! Orville and Wilbur Wright worked together to develop the first self-controlled motorized flying machine. Their team efforts also lead to improved bicycle pedals and faster sleds. Children review technological advances in flight and work together to produce improved paper plane designs. They will work as a group to put historical flight events in chronological order. The children then step into space by launching self-built rockets and loading a pay load capsule puzzle. These flight fanatics go home with a squadron of paper airplanes for further test flights. Science Fiction – Inventing means dreaming! Jules Verne and Isaac Asimov wrote about things that would be available in the future. These science fiction writers developed the reality of their current technology into future possibilities. The children join the Sci-Fi greats as they create their own futuristic idea. The children develop submarines that rise or sink and wind-up space stations. They follow a telecommunications timeline and develop one for transportation. The children decipher fact from fiction and play a future-based bingo game. These future inventors get a lesson on lasers, build a light stick and work on protecting a space ship from damaging space rays. The camp wraps up with a robotic relay and the children take home dreams of the future and new planets to explore. The week will fly by as we travel through time looking at the earliest flying machines right up to modern day rocket launches. Become a Junior Aviator and discover the principals of flight and aerodynamics. Using your new found knowledge create airplanes and other flying machines to take home and continue experimenting with. Zip up your space suit for a planetary tour while we investigate the wonders of our very own Milky Way. Join your fellow astronauts as we send 3 awesome model rockets off into the sky. It will be a blast! The Wright Stuff – Join Wilbur and Orville Wright in the race to create the first motorized airplane and investigate competitors’ designs that failed to take off. Children will explore the fundamentals of aerodynamics in this hands-on program about how things fly. Create your own paper airplanes from the classic delta dart to the surprisingly nimble tumble wing. Up, Up and Away - This program will explore the role that wind and the movement of air plays on simple flying devices such as kites, hot air balloons and parachutes. Children will experiment with solar bags, parachutes and build their own kites, boomerangs and Frisbees as they explore how flying machines get their lift. The Milky Way – Get to know your galaxy as the Milky Way is explored in this star filled day. Campers will learn about the celestial bodies we can see from earth and those that are too far away to see. Children will investigate how the cosmos has affected us on earth and why star gazing is more than just a hobby. Join the astronauts in space and learn about the challenges that face astronauts both in the space station and outside during space walks. Newton’s Loco-Motion - Sir Isaac Newton was very curious about how things moved. Discover Newton's 3 Laws of Motion in this hands-on program. Children will experiment to learn how inertia works by practicing the classic table cloth pull. Watch out for falling apples as children learn about the force of gravity that pulls everything back down to earth. Rockin' Rockets – Learn all about the basics of model rocketry as campers launch 3 rockets and make their very own model rocket to keep the summer fun going at home. Campers will explore how Newton’s 3 laws make space flight possible and learn the key parts of a rocket that allow them stable flight. Cool-off as children use pressure to blast off some water rockets. Yes, we are Rocket Scientists! All things rocket will be explored. This action packed week focuses on model rocketry, the physics behind rockets, the parts of a rocket and rocket stability will be investigated through 10 rocket launches. Campers will build several types of model rockets that can be launched at home. Children will be divided into groups to help with the launch of the model rockets so that they all learn how to prepare, launch, track and recover the rockets safely. Rocket Basics - Campers will create a rocket journal that they will use during the camp to record all of their experimental data. They will learn about the history, parts and functions of a rocket and learn the model rocket safety code. Children will build the MS Sky blazer and altitude trackers to help determine how high our rockets fly as we launch of the first of 10. Rocket Flight - This day will explore what makes rockets fly, the parts of a rocket that are involved in flight, and how to achieve stable flight! Children will make the Bog Roll Rocket and experiment with other methods of launching rockets including air pressure. Astronaut Training - Campers will learn about the history of NASA's rocket program and begin their exploration of the universe. They will build the paper tiger model rocket and create flying fizzlers, a rocket powered by a simple chemical reaction. Campers will learn how Newton’s 3rd Law of Motion affects rocket flight as they create their paper air rockets. Mission Recovery – Campers will learn about how rockets are recovered safely. Both the real life NASA shuttles and their own model rockets will be investigated and compared to discover how their recovery systems work. Campers will launch their flying fizzlers and continue exploring how Sir Isaac Newton has helped space travel. Go for Launch! - The final day in this week long program will focus on rocket transportation, rocket staging and advanced rocket launches. Campers will discover the advantages of rocket staging attaching small rockets to the tops of larger rockets. Children will learn about the awesome power or air pressure as they use it to launch water rockets into the sky. Crayola® World of Design is a summer camp that takes kids on a journey to the edges of their imagination – and beyond! They learn about Mars, the rainforest, and cities of the future, and get engaged in the creative design process to solve real-world problems. Each camp day focuses on a specific field of design, and our young architects, illustrators and graphic designers develop their ideas from concept, to sketch, to finished product. They bring their concepts to life by experimenting with Crayola® products, and exploring art techniques like sculpting, storyboarding, mixed media, and collage. Combining art, design, fun active games and inspiring themes from around the world, this camp is designed to inspire! GAME ON! Board Game Design - We are diving into board game design! Our mission is to create a board game that teaches players about the wonders of ocean life. We’ll design the game board, cards and pieces, and then challenge each other to play! MARS HABITAT Martian Habitat Design - Our mission is to design a habitat for a Martian colony. We will explore architectural design to imagine a practical home for people living on Mars. Then, we’ll sculpt our designs to create our own 3-D models. PICTURE PERFECT Movie Poster Design - Hooray for Hollywood! We have been challenged to create a poster to promote a movie. We will learn the elements of graphic design to create exciting, eye-catching posters. COMIC BOOK HEROES Costume Fashion Design - We’re dressing up our very own superhero! Superheroes look their best when drawn in action poses, with faces that tell their story. We have superhero templates and fashion textiles to kick-start the ultimate comic book star! FUTUREVILLE Urban Design - We're designing a city of the future! How will we handle the traffic flow of all those who work and live in the city? Our mission is to create a pop-up vision of a future metropolis whose citizens get around safely on foot, on wheels, and in flight! Embark on an around-the-world cultural adventure− explore far-off places and learn about the people who live there, from the Americas to the Ivory Coast, from the cosmopolitan to the countryside. Experiment with Crayola® products, while trying art techniques developed by local artists and artisans. Make a different masterpiece each day, including a dot art canvas, a mini Pakistani bus, a mud art painting on fabric, and an imperial Russian egg! Bring the unique creations home and build a globally-inspired art gallery. MUD ART – Africa - Let’s take a closer look at textiles and their designs− the symbols, patterns and borders on a cloth can be used to tell stories. We’ll use stencils of creatures that are meaningful to the people of Korhogo to paint a wall-hanging using earthen colors. ABORIGINAL DOT ART – Australia - We are going to the Land Down Under! Enter Australia’s Western Desert and see how family stories are carried from one generation to the next. Every family has its story, and we will pass on our personal tales by painting with the dot art technique used by Australia’s aboriginal peoples. ANIMAL SCULPTURES – Mexico – It’s time to turn a fantastical dream into a fantastic work of art! Let’s go to Oaxaca, Mexico and learn the story of the alebrije dream and how it unleashed a whole new art form. We’ll take our creativity to the wild side byblending fauna and flora into amazing animal sculptures. TRUCK ART – Pakistan - We’re driving into a kaleidoscope of colors when we visit Pakistan! The roads are full of decorated vehicles, each one made to its driver’s liking. We will observe the basics of Pakistani truck art, and apply what we learn to create our own eye-catching model buses. IMPERIAL JEWELLED EGGS – Russia - We’re sneaking a peek at a collection of treasures made for the royalty! Over 100 years ago, the Russian czar had the jeweler, Fabergé, create ornate egg-shaped gifts with precious metals and gems. We will learn how to design and sculpt an eggs-travagant gift of our own!